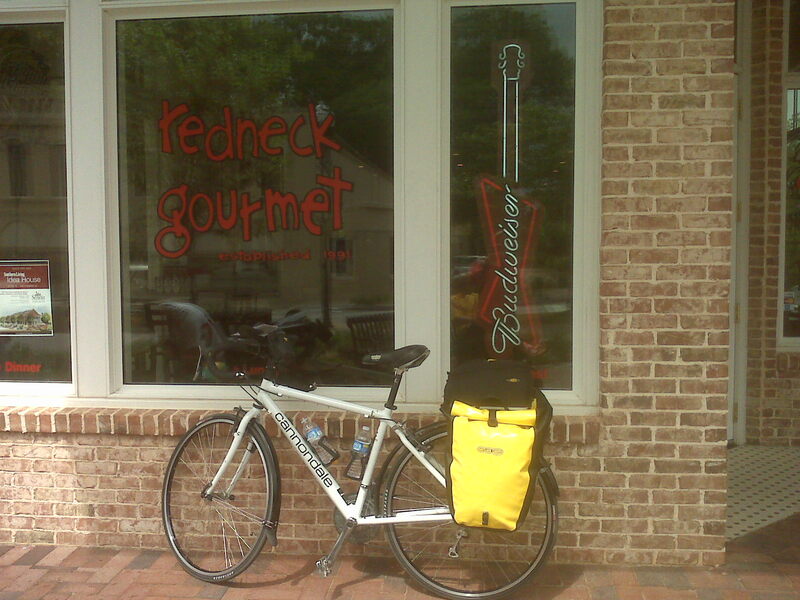 The picture tonight is not very exciting, but my trusty steed is parked in front of the Redneck Gourmet restaurant in Senoia, Ga. Only 11.3 miles into the trip and already stopping to rest!) 51.9 miles today. Very humid, warm but not hot, afternoon headwinds and surprising rolling hills. Tom felt fine but I was exhausted. He had chocolate pie at lunch and I didn’t. I may need to re-think that. Tom had a lot of trouble today with his eyes swelling, almost putting him out of commission. He got it under control with a combination of eye drops, wearing a mask to control the generalized histamine reaction, and some timely Benadryl Allergy. Thank goodness. We’re living large at the Super 8 in LaGrange, the cheapest we could find. Clean, with a good shower, and that’s really all we require. Our friends Rich and Colleen Clubine have been saying for a year and a half that if we did this, they were going to drive down the first night and take us to dinner, and spend the night. So that’s just what they did. 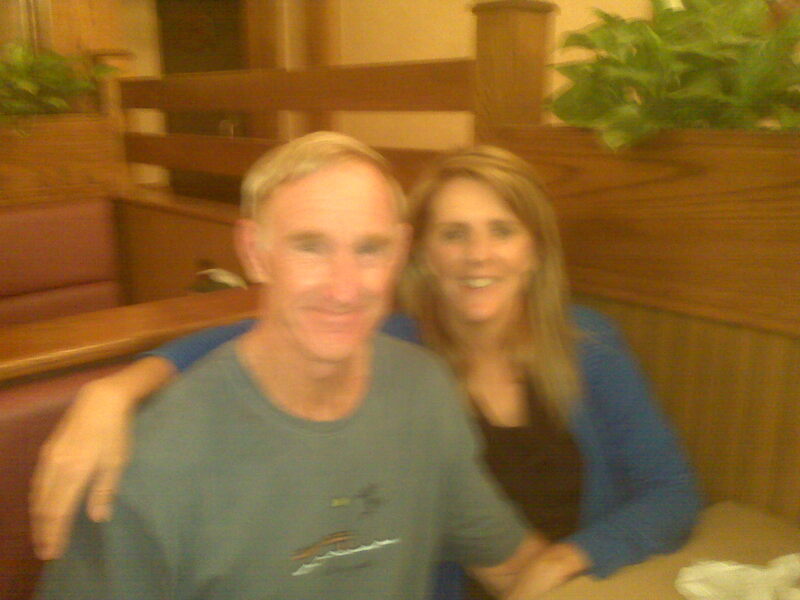 We had a wonderful dinner at a nice Italian restaurant just off the square in LaGrange. My friend and former boss lady Lori Jeter was able to meet us for dinner with her husband Bubba and her lovely daughter Mallory (one of 4 lovely daughters). We had a great time. Colleen and Rich are staying upscale at the Holiday Inn Express nearby and we plan to meet them for breakfast tomorrow before we head out. Prediction is for 90 degrees tomorrow. I plan lots of rest stops. Tomorrow night is Opelika, AL. 46.51 miles today but we fought for every foot of forward progress. In our thirty-something years of cycling we have never seen headwinds like this. 29 mph gusting to 35, coming all day from the south as we rode south. We think the air is being sucked north by the storms in Tennessee and thereabouts, but what do we know. I’m sure we will face harder days but for now I am grateful to have this behind us. Once again I’m exhausted, but Tom says he’s feeling pretty good. So far we have dodged the storms, but the weather pros are calling for 100 per cent chance of severe thunderstorms here tomorrow. Some would say we’re crazy, but we’re not suicidal, so we may be taking tomorrow off. We’ll see how thiings look in the morning. No picture tonight- Tom shot me in front of the Alabama state line marker, but the picture is gone! One of those great mysteries of technology! We love hearing from you. It makes us feel you’re here with us. Lindsey is being very faithful about forwarding your e-mails. Tomorrow’s another day. A good night’s sleep and I’ll be a new person! Tom can wake up as the same person since he’s not feeling beaten down! I almost forgot-my good friend Babs Young at Torch Lake has arranged for our daily e-mails to go to Gerry Sell, a nice lady in our local area up there who has a website called Torch Lake Views. I guess you would call it a blog, and she covers all kinds of local goings-on. So now we’re on there, and people have written in with comments from as far away as the UK! We’re famous! 🙂 My point in telling you this is that you can see our letters (and lots of other nifty stuff) on Gerry’s website. That’s all for now! Tomorrow’s destination is either the southside of Montgomery, Alabama, or right here at the cheap Travelodge in Opelika. Stayed “home” today to wait out the storms and flash floods. I think it was a good call – the weather is clearing, and best of all, the wind has died down. We can start the day with fresh attitudes and fresh(-ish) legs. Spent the day today like normal people. Went to a movie did laundry, got bored. Looking forward to mounting up tomorrow. Not much photo-worthy today so just us at the Western Sizzlin. Day 4: 73 miles with a tailwind! Wetumpka, AL The picture tonight is of the dam and magnificent falls on the Tallapoosa River in Tallassee, Alabama. A total surprise and a real treat. We rested on a park-like hillside overlooking it before heading to our destination of Wetumpka. Staying at the oldest, dumpiest motel around (channeling Norman Bates), with the surliest proprietor. But the next choice was 3-4 miles away, and after 73 miles today we didn’t care. Those of you following us on a map may notice this is not south Montgomery, where we said we were going, nor is it 73 miles from Opelika. We started out toward Tuskegee and beyond, but after some beautiful riding, reached a road that I found unacceptable. Went about 5 miles on it, no shoulder, lots of high speed traffic, huge trucks… The less said, the better. Re-grouped, changed directions, now passing Montgomery to the north. Still no shoulder and too much traffic for my tastes, so we’ll try to let the GPS take us on smaller roads tomorrow, then back onto my maps on Hwy. 80 which is 4-lane and should have a good shoulder. Thinking Selma tomorrow night and then a short day to Chris and Beverly’s house in Browns, AL. Camping tomorrow night is still a possibility. Met a very nice family tonight at the local diner. The little girl was full of good questions like where are your clothes and where are you sleeping tonight? We got some valuable input from them about roads around here, and the Dad gave us his card and invited us to make a rest stop tomorrow at his workplace next to the Montgomery Airport. We may take him up on it. Equipment is holding up great and our body parts are doing almost as well. Hot and sunny today, tomorrow predicted to be the same. Here’s hoping for more tailwinds! Writing this in the morning. Just too tired last night. 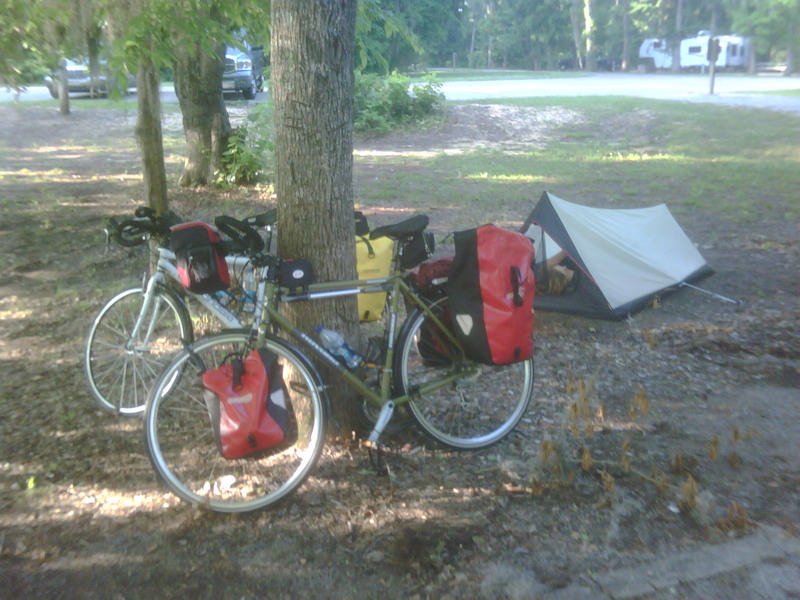 Today’s picture is of our tent at the campground but will come as a separate mail. I’m writing this from my sleeping bag, don’t want to get up first to take the picture. 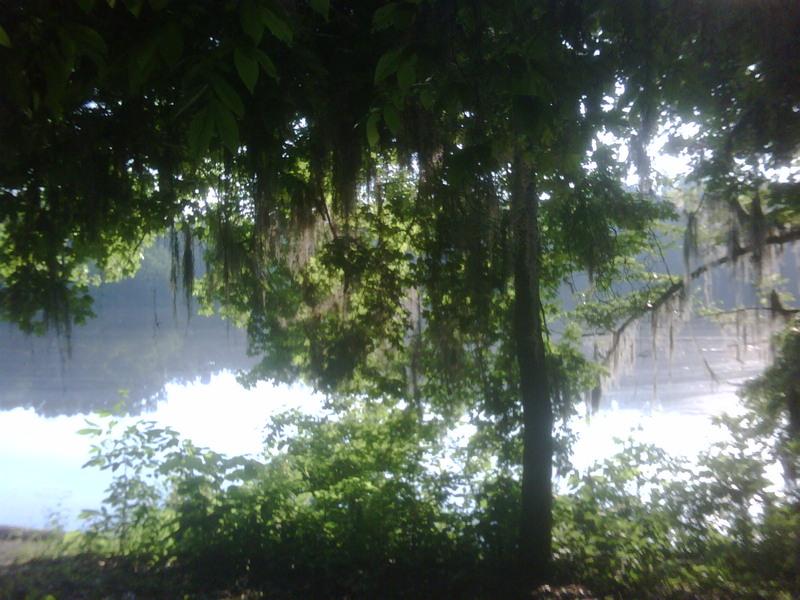 Will also include one of the very cool Spanish moss on the trees. I was told once though that it is full of bugs! We weren’t sure how the camping would work, but it has been fine. We both slept well (we were very tired), we have hot showers here, and a very picturesque campsite surrounded by a quiet lake. Selma was out of reach distance-wise, and this is actually the spot where I had originally scheduled us after the 4th day riding. Dinner was a little sketchy, just what we brought with us, so stuff like crackers, peanut butter, beef jerky, protein bars. Yum. Yesterday was a real mixed bag. We rode a couple miles of dirt road, some extremely busy 4 lane but with a shoulder the size of a full lane, about 20 miles of beautiful back roads, and a very dangerous 4 lane with no shoulder which scared me sufficiently that we got off and walked the bikes while we tried to figure out what to do. On Google maps on Tom’s phone we found a turn-off about a mile up, so we rode on, watching our mirrors carefully and pulling off the road when cars came in our lane. The problem is that I have us routed on that road for the next two days and there are very limited alternatives. I will not ride that road. I did not bring us out here to get us killed, and that is what will happen. So my job now is to spend some time on Google maps looking for alternatives, or arranging transportation for us to Demopolis, AL. I am not too proud to give up riding this section if that is the only safe option. Tom is much less alarmed about the situation, but he is willing to do what makes me comfortable. He still sees this as a ride on a schedule, which is just his way, and riding extra miles on another route seems counterproductive. We still expect to be at Chris and Beverly’s tonight, but not sure how. We may arrive with the bikes on the back of a pick-up truck! We’ll let you know! 51 miles today. It was a good day, Tom even says it was a good day, but he is very tired. The heat, around 90 degrees, is wearing on him. We’re looking forward to cooler weather maybe Saturday. We found an alternate back road that cost us about ten extra miles and Tom didn’t much care for that, but the road had almost no cars, so I was very happy. 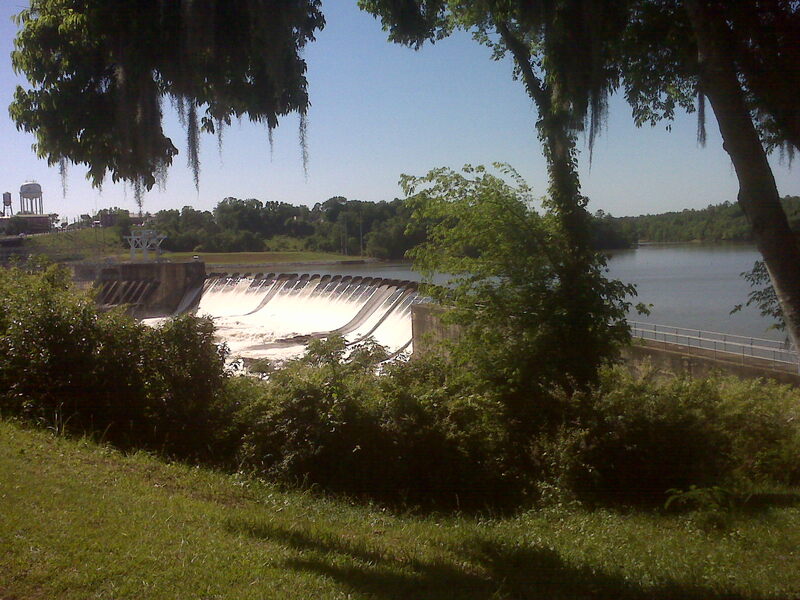 It brought us into Selma at about 28 miles, which made it possible for us to go on to Browns. Our friend and host for tonight, Chris Smith, drives from Browns to Selma to work every day, and had made a special point of scoping out the status of the shoulder on Hwy. 80 west of Selma. He thought it would work, so we worked our way out of Selma and gave it a try. Some of it was workable, and most of it was a dream, allowing us to cruise along almost in our own lane, completely separate from traffic. We don’t know how long this shoulder will last, but we will start out toward Demopolis on Highway 80 tomorrow and find alternates if we have to. Demopolis is only 30 miles away. We are hoping for a short day, as we badly need some rest. We have a long day to Aliceville the next day, and plan an off day once we get there. We finished earlier than usual today, pulling in to Chris and Beverly’s very cool circa 1880 restored farmhouse, and we were greeted by their many dogs and cats. It was a nice dose of animal, as we’re feeling a little lonesome for our own critters (well taken care of at Lindsey’s house in Knoxville). We sat on the porch swing to rest and check e-mails, did all of our laundry, and had a wonderful steak dinner with all the trimmings, prepared by Chris. It was a good day followed by an enjoyable evening. The picture is, as you can see, taken as you enter Selma. We walked the bikes across the Edmund Pettus Bridge, famous from the Montgomery to Selma civil rights march. I’m not sure why I’m always the one in the picture. We’ll have to get Tom into the action. We were last here for Chris and Beverly’s wedding almost four years ago, and it was 105 degrees. It was 90 degrees today, and we’ve decided it’s just always hot in Selma. 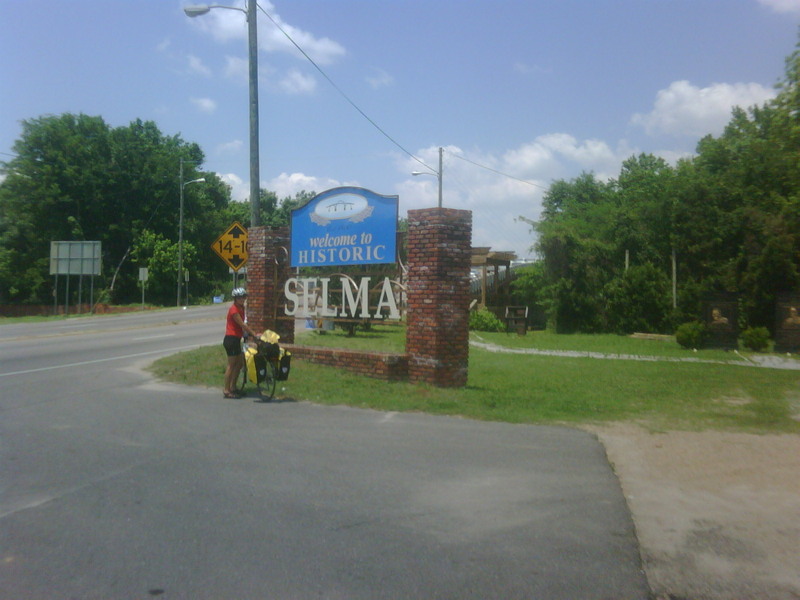 Arriving in Selma, having ridden the entire way, was a victory of sorts, but I don’t want to get cocky. I’m sure we have route challenges ahead of us, but we’ll handle them as they come. Only 22 miles today, flat to rolling with some tailwind, and a great shoulder. At one point Tom commented that “It doesn’t get any easier than this!” Then the wind shifted around, but it was nice. The ride to Demopolis would have been more like 30 miles but Chris took us 10 miles in his truck to the other side of a small town that the locals seem to feel it is not safe to be near. The people at the gas station/grocery store had, without us mentioning it, told us not to ride through there. We didn’t take it too seriously, but Chris agreed it was NOT someplace we should be on bikes. So we submitted to local opinion and let him drive us. We’d ridden enough extra miles to get to Browns, chasing around for alternate routes, I don’t count that ten miles as cheating. Just an extra layer of experience in this journey. Thanks again, Chris. Had lunch in a nice restaurant (perhaps the only restaurant) on the pretty square in Demopolis. Bought sunglasses at CVS as I left mine somewhere yesterday. Fortunately they were cheap. I’m reluctant to borrow Tom’s extra pair as they are good ones, and I will lose them as quickly as I lost his (cheap) reading glasses the other day. Makes you wonder how I got us this far. We have spent time finding alternate routes, but we actually haven’t been lost at all on the trip (I shouldn’t have said that!). Anyway, we spent the last few hours resting. It’s a little boring, but our bodies just need some down time. The picture is taken from the door of our motel room. Our friend Norma in San Diego lived on a boat with her husband for a while, and remembered a good restaurant at the marina here. Chris and Beverly agreed, and told us there was a motel here as well. 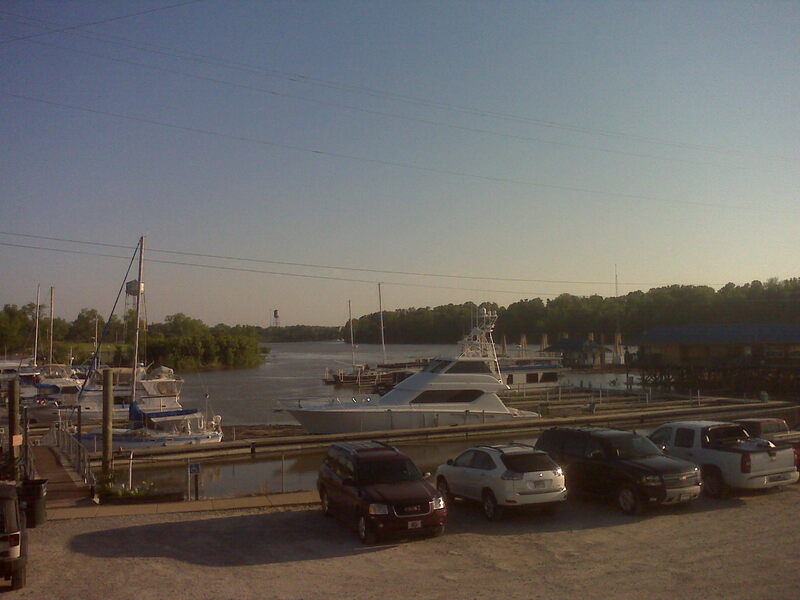 So here we are at the Demopolis Yacht Basin, staying at the River View Motel. This is the Tombigbee River, which I confess I had not heard of until I spent the last year pouring over maps of the area. (I spent all that time choosing routes, and we all know how that worked out!) The Black Warrior Lake is also here. Demopolis is significant for us because it is where we finally “turn the corner” and begin to head north. All of our efforts until now have really just been to avoid the Smokey Mountains, so this might feel more like progress. We’re not even back to our original latitude yet! When we look at the map, though, I can see we’ve gone somewhere. Wonderful Story, and wise lady. This from an old, old cyclist who was pretty careful in the day. Love reading about your adventures…..you must be having a great time. Will look forward to hearing more as the days go by….